OUT OF STATE ADOPTIONS: We do allow out-of-state adoptions for dogs, however, the adopter MUST come to Houston to get the dog and take the dog home with them. We do not allow our dogs to be shipped. Also, our puppies can only be adopted to the immediate Houston vicinity as it takes 4 months to get them completely vetted at our vet here in Houston. We will not allow our dogs/puppies to be adopted out of the area without being spayed/neutered. We spay/neuter puppies at 4 months old. Looking for a new best friend, look no more. Wabi is right here. I am a super sweet big boy that is ready to be there for you. Don't let my size scare you as I am a big baby. Just about a year old or so, I am fully grown, but past those messy puppy issues of potty training. I know where I am supposed to go potty, just take me out and I will take care of the rest. I do like toys and you might want to keep anything picked up you might not want me to confuse with one of my toys, things like books or papers. I have not chewed on anything major but better not to be tempted until I am little older. I sleep well at night and I don't mind the crate until you can trust me when you are gone. I do love to cuddle on the couch so I hope there is room for me. Come see me this weekend and bring me home for a great 2018! 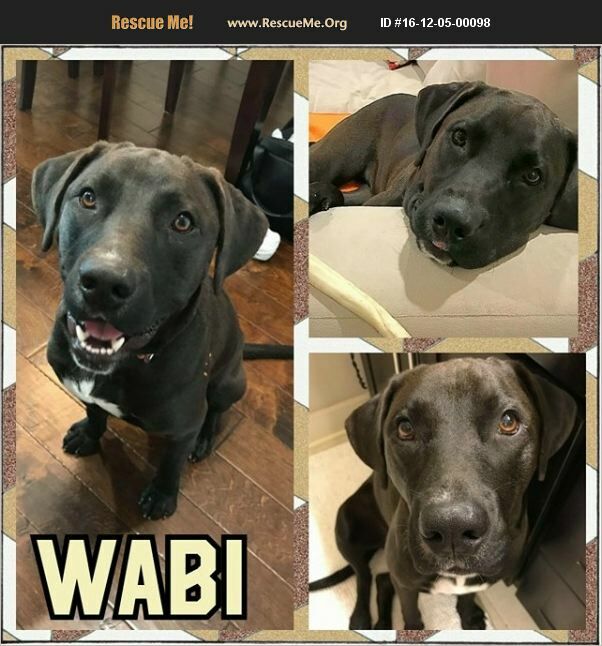 Wabi is a Male Lab Mix that we estimate to be born around 10/1/2016 and weighs 60 lbs. PUPPIES: Young puppies that have not had their second round of puppy shots will not be at the Adoption Center for our weekend adoption events. If you are interested in adopting a puppy, please fill out an application on our website http://www.k-9angelsrescue.org/k9_angels_rescue_adoption_process.html. If your application is approved, a meeting can be arranged. Also, we only adopt young puppies locally due to the 4 month time frame it takes to get them fully vetted and altered. SPAY/NEUTER: As we believe proper healthcare of one's pet is a requirement of good ownership K-9 Angels Rescue only adopts out dogs that have been fully vetted. If the dog being adopted is not already altered at the time of their adoption, the dog will be altered within 2 weeks of adoption at our vet at our cost, with the exception of puppies which will be altered as soon as the puppy is ready. NOTE: All dogs are officially the property of K-9 Angels Rescue until they are altered by our veterinarian. Please LIKE and share our Facebook page: www.facebook.com/k9angelsrescue.